Last week, I bumped into a dance video of that popular moonwalk. Not performed by Michael Jackson this time, but by Bill Bailey. If you follow my facebook page, you probably have seen this movie. It made me think about other popular dance styles or typical dance moves that ruled the dancefloor back in time. Here are a few popular ones that lasted from the 1920s until the 1960s including some movies that captured those lovely vintage dance styles! This popular upbeat 1920s dance was named after the city Charleston in South Carolina. The most important dance moves probably find its origin in a African American dance called “Juba”. 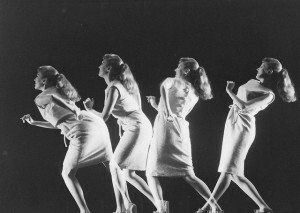 The typical Charleston rhythm was popularized in 1923 when composer James P. Johnson composed the song: The Charleston. It became one of the most important dance hits of the 1920s. Peak years of the Charleston dance were the mid-1920s.